I will start off this post with a disclaimer…Once you go aerial you can’t go back! 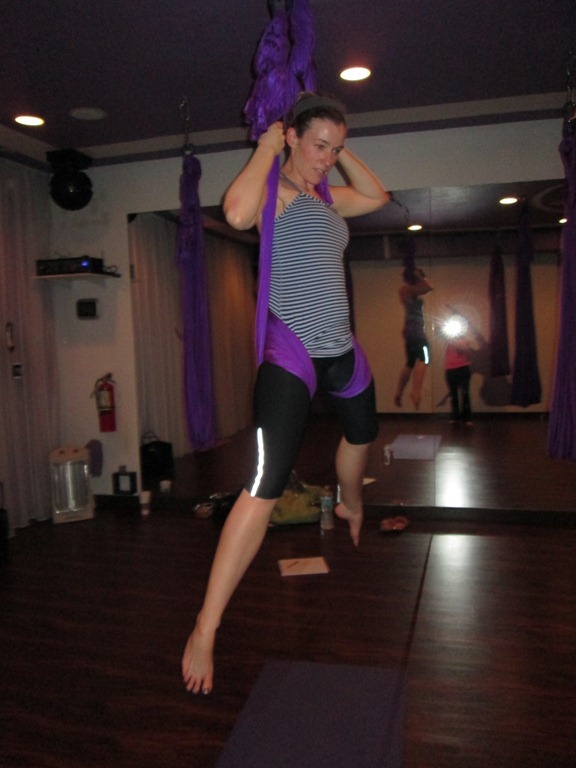 Aerial yoga brought a whole new dimension to my workouts, and I honestly cannot imagine my fitness routine without it. 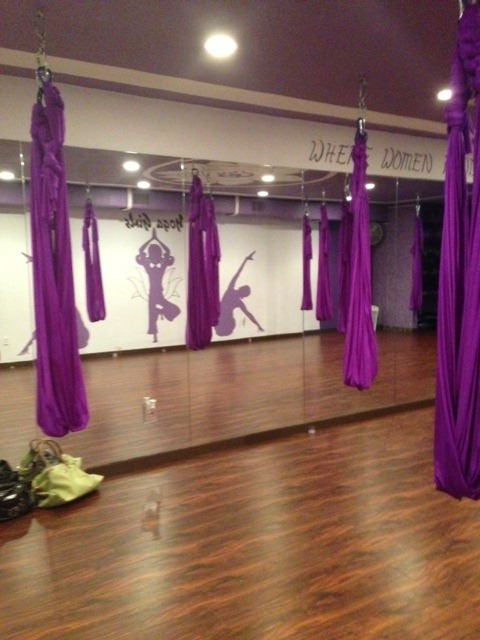 Aerial yoga brings you so much in one class. You get to stretch, balance, strength train, and more. 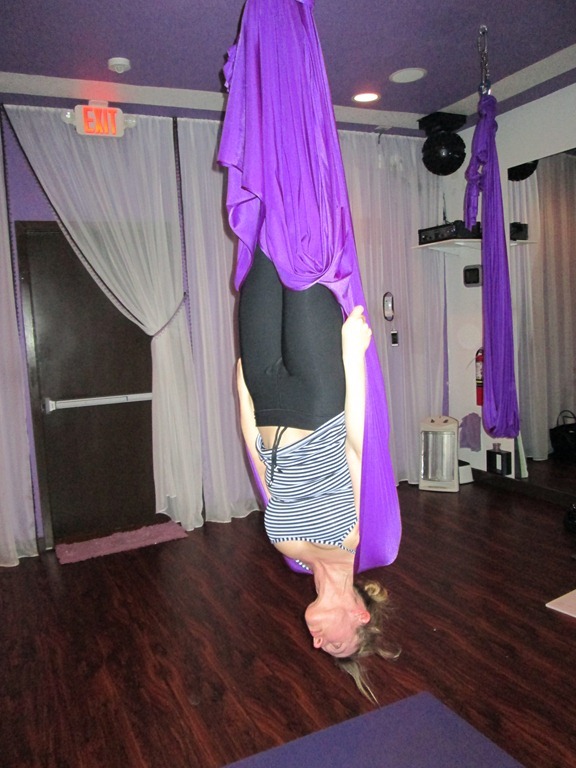 I cannot wait to continue my own study of aerial yoga and progress even farther. I arrived at Yoga Girls Studio in Edgewater, Florida last Friday beyond excited to start learning more from Allison Sipes. I had my notebook and camera ready to take more step-by-step pictures. We started with a basic one hour class. I loved all the different types of stretching and warm-up flows we did in the beginning of class. It really helped stretch my body out from Thursday’s aerial silks workout. We worked on transitioning from the silks into a regular yoga flow on the mat along with some amazing balancing moves using the hammock. From there Allison went on to teach me other flows and more intermediate stretching and strength work using the hammock. The “Spiderman” is a favorite of mine for stretching. It felt so unbelievably good. 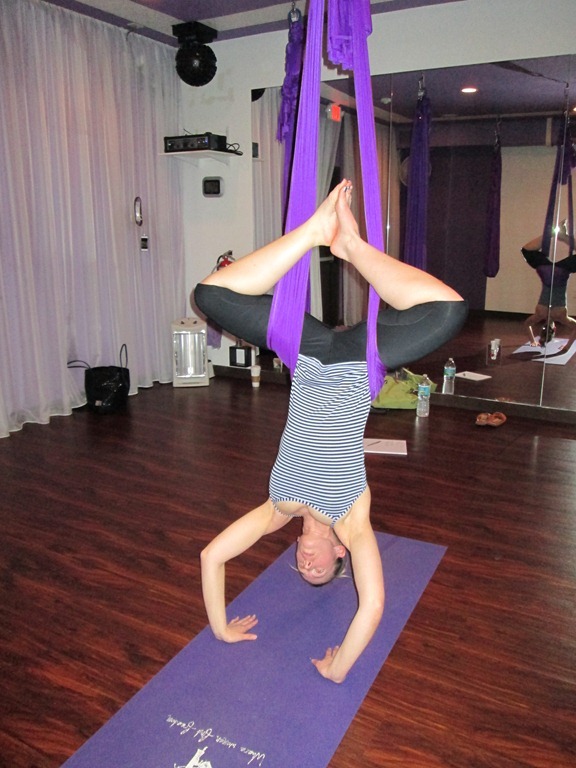 One of my many favorite things about aerial yoga is the amount of core work you do in class. The whole time you are using your core to stabilize yourself, and then there are so many different moves and/or flows that you can do that work your core even more. My favorite was skyward dog and scorpion. Not to mention the hundreds of other moves we did on Friday that worked my core in such a fantastic way. One of the more challenging moves for me was to go from a pike into the stretch you see above. It really worked every muscle in my body. I loved my days with Allison learning silks and all that you can do with them! I learned so many flows, cuing, finding your center, spotting, and more. Now to hit my own hammock and continue learning and practicing. 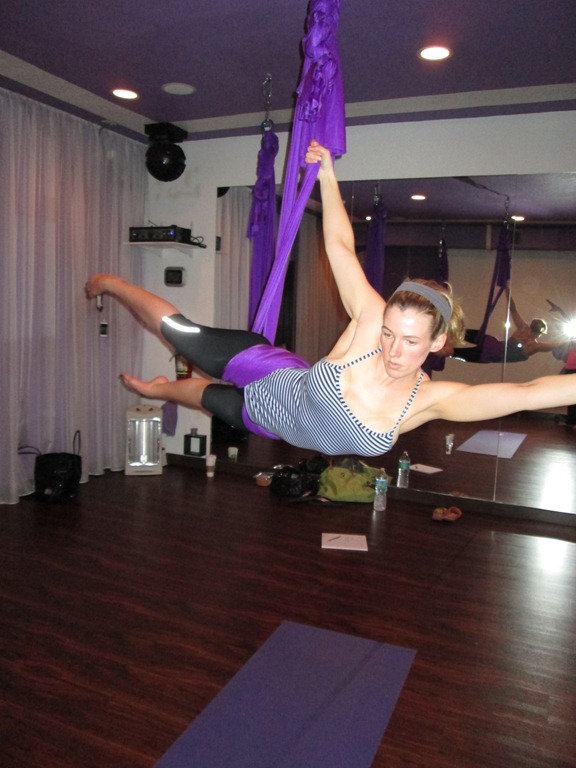 Aerial yoga can be for everyone! Although it would really help if you had done regular yoga, so that you are accustomed to the moves you will be making. The best part are the inversions and balancing moves that use the hammock. So many people have a hard time with handstands and such in yoga classes, and the hammock gives you excellent support while allowing you to still reap the stretching and muscular benefits. The video above is one that I found on YouTube that is a great example of some of the moves you would do in a aerial yoga class. I highly recommend that you sign up for a beginner class today and give it a try. If you are in Central Florida, head over to Yoga Girls Studio and sign up for one of Allison’s classes or a private lesson. Allison is an amazing instructor and mentor, who will be there to help you with all of your fitness goals. 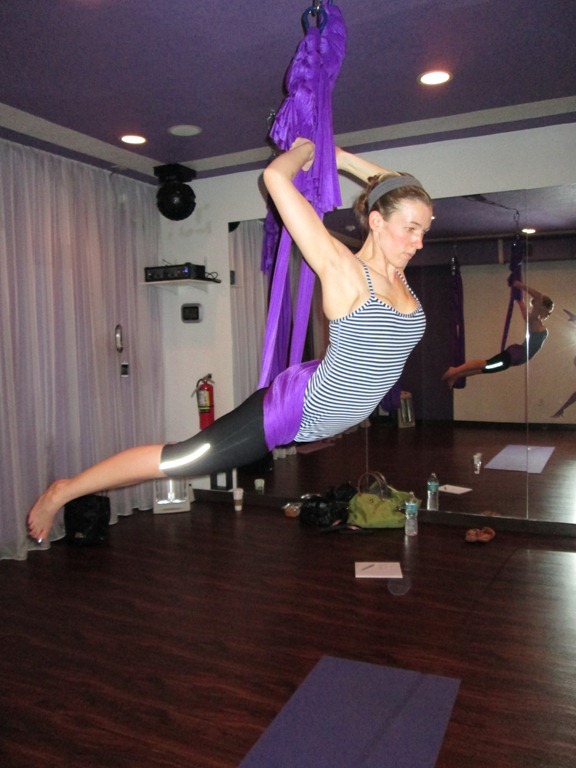 This entry was posted in Florida, Workouts and tagged aerial yoga class, allison sipes, beginner aerial yoga, learning aerial yoga on February 12, 2013 by fromfltond. That is SO cool! I’d love to try it! I love hot yoga because of the awesome warm stretching but this looks really neat! I wonder if I’d be strong enough to hold my weight for it! THANKS for sharing!! Aerial was so amazing for stretching! I could have hung out in some of the poses forever. The weight limit is 1000 lb. 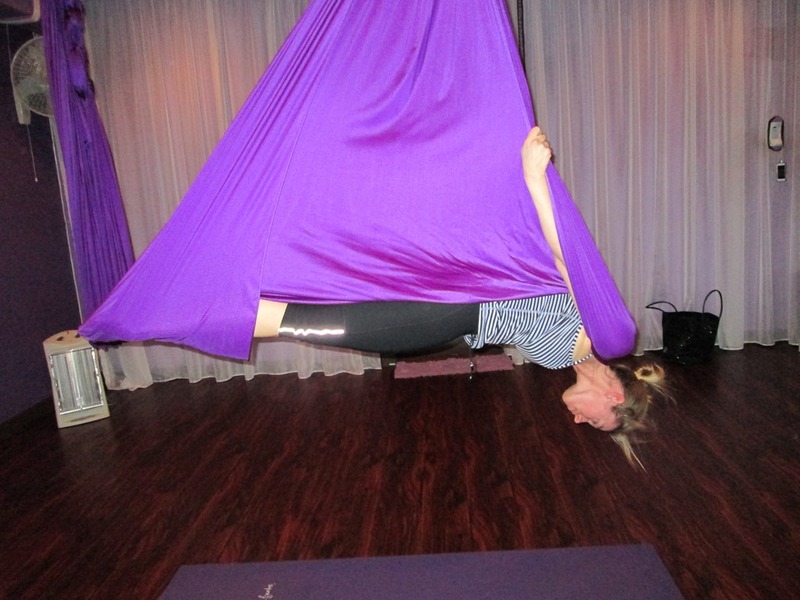 I’ve taken a couple of aerial yoga classes recently and also love it!